This is a question often asked by business owners. They know sales are being made, but don’t know where the money goes. They do know that it’s not in the bank! The answer lies in the activity in all the other balance sheet accounts. 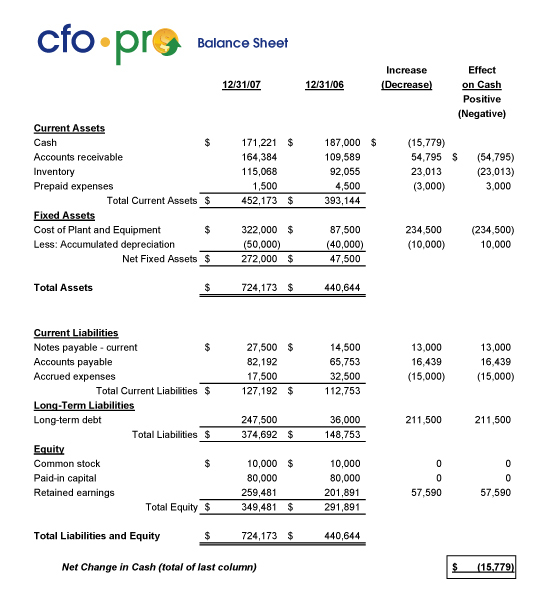 Look at the following comparative balance sheet. Note that an increase in accounts receivable has a negative impact on cash due to more sales not being collected which ties up cash. An increase in accounts payable means that some vendor payables have not been paid which has a positive impact on cash. The last column becomes your de facto cash flow statement. And you know where the cash went! An increase in any asset other than cash has a negative impact on cash and a decrease in any asset other than cash has a positive impact on cash. An increase in any liability has a positive impact on cash and a decrease in any liability has a negative impact on cash.